While using an application, a user might need help on performing an operation or require information about a button or a dialog box. To assist the user while using the application, it is a good practice to provide help system with the application. 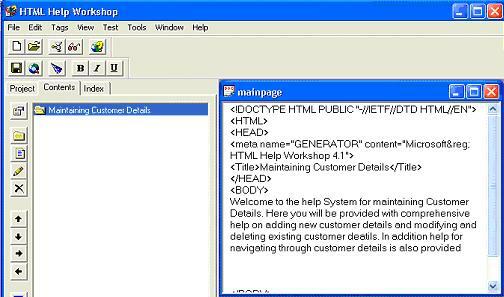 In this article, we will discuss the creation of a help system using HTML help workshop. We will also discuss the creation of Context-Sensitive help, pop-up help and tool tips. 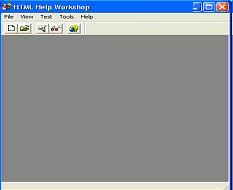 HTML Files: These files contain the text that appears on each page in your Help System or web site. Graphics and Multimedia files: These files contain links to graphic, sound, video, animation and other files. Help Project Files: These files contain information about the location of your topic, graphic and other files. Content Files: These files contain the information that appears in the table of contents for your help system or web site. Index Files: They contain the information that appears in the index for your help system or web site. Table of Contents: A table of contents provides users with a hierarchical view of the various help topics. Index: An index help users to quickly search for information they need. 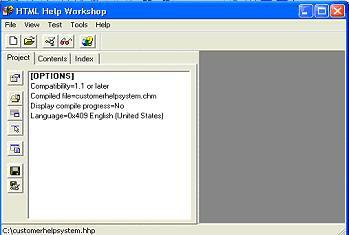 The files in the help system are managed by creating a help project file. 4. Click Next button. The new project-Destination screen is displayed. 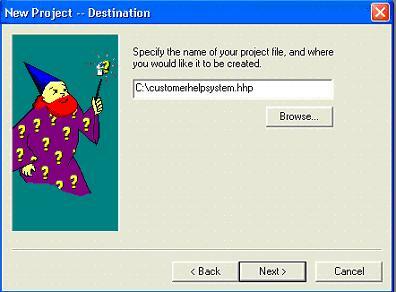 Enter the name of the project and the path where you want to create the project, as shown and click next. Note that the file has extension of hpp. 5. In case you have some existing files that you want to include in your help project, select the types of file and then click the next button. 6. Click Finish on the next screen. The following screen is displayed. The project tab is active by default. 1. Select File->New. The new dialog box gets displayed. 2. Select HTML file and click Ok. 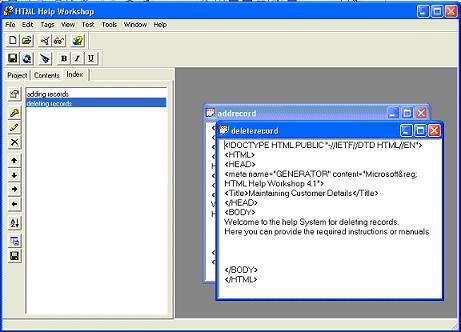 In the HTML dialog box, enter the title for the HTML page and click the OK button. 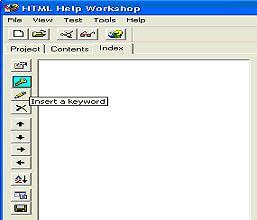 Save the HTML file by clicking the save icon on the toolbar. 1. Click the index tab. 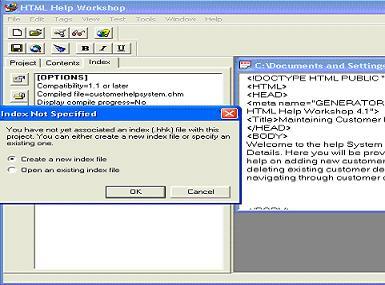 A message box, as shown below is displayed asking whether to create a new index file or open an existing one. 2. Select the Create a new index file radio button and click OK.
3. In the save as dialog box, enter the name and path for the index file. 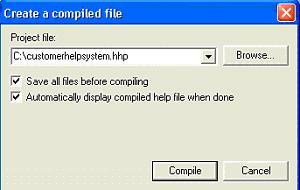 It is better to save the index file in the same folder where you have your help project (.hhp). The index view will be displayed. 5. Type a search keyword in the keyword text box and click the Add button. The Path or URL dialog box is displayed. 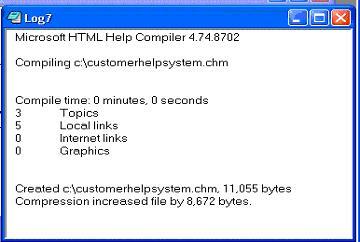 By default, the currently open help project is displayed in the project file list box. 6. 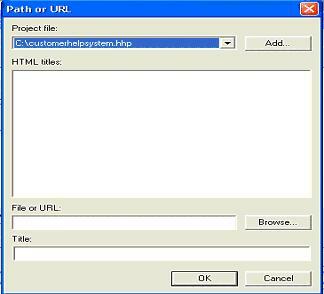 Enter the HTML file to be associated with the keyword by entering the file name in the File or URL text box or by selecting the file by using the Browse button and click the OK button to go back to the Index Entry dialog box. 7. Click OK in the index entry dialog box. b. Select Create new and click OK.
c. The save as dialog box appears. Enter the name and path for the table of contents. It's better to have the same path as the .hhp file. b. The Table of Contents entry dialog box appears. Enter a heading title in the Entry title text box and click the Add button. The file or URL dialog box opens. Enter the filename in the file or URL text box and click the OK button to go back to the table of contents entry dialog box. c.	Click the OK button. The following window will be displayed. The heading that you created is displayed with a folder icon before it. b. A message box will be displayed asking whether you the page is to be displayed at the beginning of the table of contents file. You can specify a default HTML file for your project. 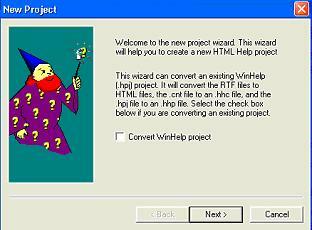 When the help file is displayed to a user, the HTML file is set as the default file for the project is opened and displayed automatically. To set a default file for the project, click the project tab and then click the change project options icon from the toolbar. It looks like the one shown below as shaded blue. Enter the name of the file that you want to set as the default file in the default file combo box and click the OK button. 1. Select File->Compile. 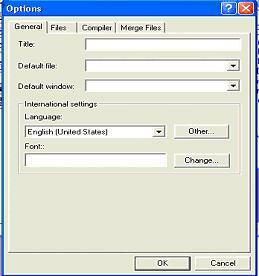 The Create a compiled file dialog box is displayed. By default, the path of the current project file is displayed inn the Project File combo box. 2. 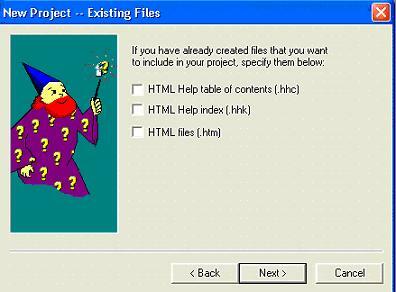 Select the first check box to save all the created files before compiling the project, select the second check box to specify that the compiled help file be displayed automatically when the compilation is complete. When running an application, a user might need help on the function of a user interface element. The user should be able to access the help system by pressing the F1 key. To provide help for an application, you need to link it with a help system. 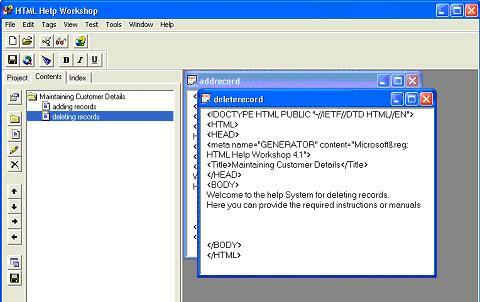 A help system can be associated with your Windows application with the help of the HelpProvider control. 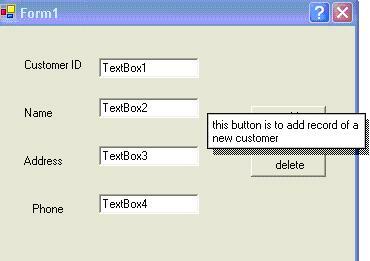 Context Sensitive help assists users by providing help based on a specific dialog box or control in a program. This enables users to get specific about whatever part of the program they are using at any given moment. Add a HelpProvider control to the form. Set the ShowHelp on <HelpProvider Control> to True. 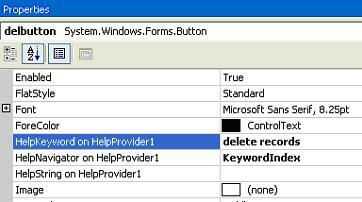 Set the HelpKeyword on <HelpProvider Control> to an appropriate keyword for retrieving help. AssociateIndex: Displays the index for a specified topic. Topic: Displays a help topic. 1. Link your application with a help file. 2. Add context sensitive help to various form elements. a. Open your form in design mode and drag a HelpProvider control. b. Open its properties window. Click the HelpNameSpace property and select the help file to be associated with the control. a. Open the properties window of the form. Set the ShowHelp on HelpProvider1 property to true, as shown in the figure. This will display help for the control at run time. 3. Enter a search keyword for the HelpKeyword on HelpProvider1 property and appropriate value for the HelpNavigator on HelpProvider1 as shown in the figure. Pop-up help can be provided in an application through the Help button, also called the What's This button, present in an application to the right of the title bar. The poop-up help is most effective in modal dialog boxes. Modal Dialog boxes are the ones that are displayed using the ShowDialog() method. These boxes do not have maximize or minimize button, as normally forms have. You can see a question mark sign on the top right corner of the form in the figure given below. When you click on this question mark, your mouse pointer will carry '?' sign along, and when you click any control the associated help with that control will be displayed. Consider the following figure. 1. Set the MinimizeBox and MaximizeBox properties of the form to true. 2. Set the HelpButton property of the form to true. 3. To associate pop-up help with different controls on the form, set the HelpString on <HelpProvider Control> property of the controls to a string that specifies the help text for the control. A tool tip is a brief message for individual controls on a form. Tool tips are generally used for displaying help for toolbar icons. They can be displayed by using the Tooltip control present in the toolbox. The user can access a tooltip by pointing at the control for which the tool tip can be created. They appear when you place your mouse over a control for some time. To display a tool tip, you need to add a ToolTip control to the form and enter the text in the ToolTipText property of the control for which the tool tip is to be displayed. The tooltiptext property can be used to set the tool tip for a StatusBarPanel control, a ToolBarButton control, and a selected tab. You do not need to insert a ToolTip control in the form for these controls. But for others you will have to. The SetToolTip() method of the ToolTip control is used to set the tool tip text for a control. This method takes two parameters, the control for which the tool tip text is to be set and the tool tip text to be displayed for that control. Active: This property is used to set the current status of the ToolTip control. The property can be set to either True or False. By default it is true. AutomaticDelay: This property is used to set the time in milliseconds after which the tool tip would appear. By default, the AutomaticDelay property is set to 500. 1. AutoPopDelay: This is used to set the time period for which the tool tip is displayed on the screen when the mouse pointer is stationary in a tool tip region. When the AutomaticDelay is set, the AutoPopDelay is automatically set to 10 times of the value of AutomaticDelay, although it can be overridden. 2. InitialDelay: This is used to set the time period for which the mouse pointer should be stationary in a tool tip region before the tool tip appears. When the AutomaticDelay is set, the AutoPopDelay is automatically set to the value of the AutomaticDelay, although it can be overridden. 3. ReshowDelay: This is used to set the time taken by the subsequent instances of the tool tip to appear when the mouse pointer is moved from one tool tip region to another. When the AutomaticDelay is set, the AutoPopDelay is automatically set to 1/5 of the value of the AutomaticDelay, although it can be overridden. You can see that making of documentation can be very long and for many developers boring task. 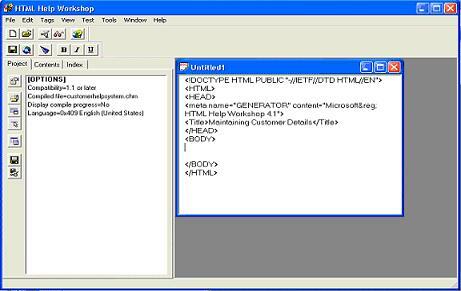 Fortunately, there are some add-ins for Visual Studio and HTML Help Workshop, like Help Generator, which can do a lot of work automatically. 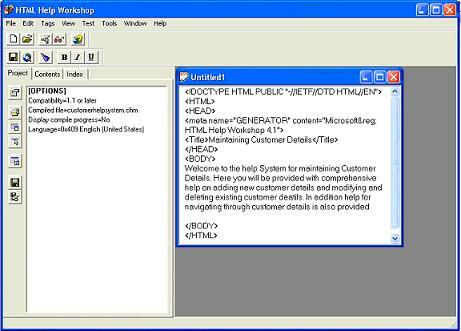 After Help Generator generate main Help framework, you just edit the files where needed through its editor.